Electricity & Gas Suppliers Ireland - Switch & Save! We all want to live in a cleaner, greener world. Switch to SSE Airtricity, Ireland’s largest provider of 100% green energy†. New Direct Debit and eBill customers only. Estimated Annual Bill €1,838.97. Average Year 1 cost including Welcome Credit €1,638.97*. Estimated Annual Bill €1,030.47. Average Year 1 cost including Welcome Credit €895.47*. As Ireland’s largest generator of wind power, we’re proud to supply clean, green energy to homes and businesses across the country. As winners of the bonkers.ie Best Customer Service Award for three years running, we’re always happy to go the extra mile for you. Loyalty is important to us and we believe in rewarding it. Whether you enjoy concerts, or trips to the zoo, we’ll give you something to look forward to. 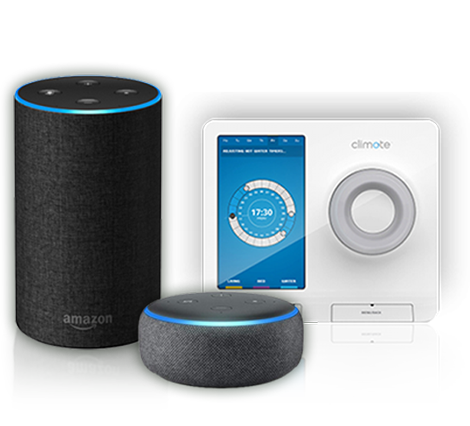 Switch your electricity to us today and get a free Climote heating control, Amazon Echo and Echo Dot. Treat the family with a day out to Dublin Zoo. As an SSE Reward customer, receive 20% off all day tickets. Small choices can make a big difference. By choosing a renewable energy provider, you’re joining the growing numbers moving away from fossil fuels and helping to power a cleaner, greener Ireland. Sign up your Business to SSE Airtricity today. We're proud to have contributed over €6.5 million in funding to communities close to our wind farms, making a difference for more than 2,500 local groups and projects. Payment can be made by having the cost of the Offer charged to your SSE Airtricity bill. Payment can be made by setting up a monthly direct debit. Valid on natural gas boilers only. Subject to booking availability, boiler suitability and geographical restrictions. We will send you a letter prior to the expiration of the contract, to arrange a time for your next annual boiler service and the payment will continue unless you terminate this agreement on receipt of this letter. Once you have signed up, there is a 14 day cancellation period. Terms & Conditions: 12–month fixed term contract, direct debit & ebilling. Offer available to new domestic customers in Northern Ireland who switch to SSE Airtricity online. Includes extra 2% using the promotional code provided. 1 year discount based on SSE Airtricity Standard Electricity unit rates. Cannot be used in conjunction with any other offer. No cash alternative. Guaranteed discount(s) against SSE Airtricity Standard electricity unit rates. All domestic electricity prices quoted from 1 June 2016. 5% VAT rate applies. Prices may be subject to change. Figures have been rounded to two decimals places. Discounts vary by meter type. This offer is available until 31 March 2017. This offer is valid to 31 March 2017. See General Terms & Conditions of Supply (PDF, 285KB). Guaranteed discount(s) against SSE Airtricity Standard electricity unit rates. All domestic electricity prices quoted from 1 October 2018. 5% VAT rate applies. Prices may be subject to change. Figures have been rounded to two decimal places. Discounts vary by meter type. This offer is valid from 14 May 2018. Tariff discounts against SSE Airtricity standard electricity unit rates. All domestic electricity prices quoted from 3 December 2018. Prices may be subject to change. Figures have been rounded to two decimal places. Standing charges also apply. 13.5% VAT rate applies. The Public Service Obligation (PSO) levy for electricity has been set at €3.95 (inc. VAT) / €3.48 (ex. VAT) per month from 1 October 2018. This applies to all domestic electricity customers, irrespective of supplier. Offer is subject to a 24 month contract. This offer is available from 16 May 2016. The price is €18 monthly or €36 bi monthly payment over a two year period. While the vast majority of houses are suitable, there are a small percentage that are not. The gas boiler service and the installation of the Climote heating control will not be completed at the same time and will be carried out separately by a qualified Gas Service Engineer and a suitably qualified Electrician. With this Offer, your subscription to the Climote remote access service is free of charge (effective from the date we install your Climote). After your contract ends, standard subscription costs will apply (currently quoted at €19.00 per year) and will be payable to Climote. We will send you a letter prior to the expiration of the contract, to arrange a time for your next annual boiler service. The Easypay Boiler Service Terms and Conditions will be the applicable T&Cs going forward and the payment as set out in the Easypay Boiler Service T&Cs shall continue unless You terminate this agreement on receipt of this letter. This letter shall contain details of how to opt out of the arrangement. View Easypay Bundle Service terms and conditions. Please see SEAI.ie for further information. The price is €12 monthly or €24 bi monthly payment over a two year period. Payment to be made to the engineer at time of service. Payment can be made by cash, debit/credit card and bank draft. Our standard boiler service terms and conditions. Boiler Cover terms and conditions. Tariff discounts against SSE Airtricity standard gas and electricity unit rates. Offer valid from 16 May 2016. Rates valid from 3 December 2018. Prices may be subject to change. Figures have been rounded to two decimal places. Standing charges also apply. 13.5% VAT rate applies. The Carbon Tax has been set at €0.00420 (inc. VAT) / €0.00370 (ex. VAT) per kWh. This tax applies to all domestic natural gas customers, irrespective of supplier. The Public Service Obligation (PSO) levy for electricity has been set at €3.95 (inc. VAT) / €3.48 (ex. VAT) per month from 1 October 2018. This applies to all domestic electricity customers, irrespective of supplier. Offer is subject to a 24 month contract. Tariff discounts against SSE Airtricity standard electricity unit rates. Offer valid from 18 May 2017. Rates valid from 3 December 2018. Rates subject to change. Figures have been rounded to two decimal places. Standing charges also apply. 13.5% VAT rate applies. The Public Service Obligation (PSO) levy for electricity has been set at €3.95 (inc. VAT) / €3.48 (ex. VAT) per month from 1 October 2018. This applies to all domestic electricity customers, irrespective of supplier. Offer is subject to a 12 month contract. Tariff discounts against SSE Airtricity Standard electricity unit rates subject to direct debit and ebill. All domestic electricity prices quoted from 3 December 2018. Prices may be subject to change. Figures have been rounded to two decimal places. Standing charges also apply. 13.5% VAT rate applies. The Public Service Obligation (PSO) levy for electricity has been set at €8.73 (inc. VAT) / €7.69 (ex. VAT) per month from 1 October 2017. This applies to all domestic electricity customers, irrespective of supplier. Offer subject to a 12 month contract. If you leave early, there’s a termination charge of €50. This offer is available from 1 April 2017. Upon sign up to SSE Airtricity, new Electricity Customers are eligible for €135 Welcome Credit and new Dual Fuel Customers are eligible for €200 Welcome Credit (the “Offer”) and will be emailed with instructions on how to redeem the Offer. Once redeemed the Offer will be applied to your account within 60 days and will be displayed as €118.94 + €16.06 VAT on Electricity Customers’ bills and €176.21 + €23.79 VAT on Dual Fuel Customers’ bills. The Offer (as defined in the next point) applies to new domestic SSE Airtricity Electricity Credit Meter customers who sign up for direct debit and ebilling (the “Customer”). Upon sign up to SSE Airtricity, the Customer is eligible for £55 Welcome Credit (the “Offer”) and will be emailed with instructions on how to redeem the Offer. The Offer must be redeemed within one year of the date that SSE Airtricity is registered as your supplier (the “Term”) or SSE Airtricity may withdraw the Offer. The Offer can only be redeemed following the successful payment of your first bill and if the Customer continues to be supplied by SSE Airtricity, and continues to pay via direct debit and receives ebilling. The Offer may be redeemed online through www.sseairtricity.com or by clicking on the applicable link contained within the instruction email. If you are unable to redeem online, please contact SSE Airtricity on 0345 601 9093. Once redeemed the Offer will be applied to your account within 60 days and will be displayed as £52.38 + £2.62VAT on Electricity Customers’ bills. Guaranteed discount(s) against SSE Airtricity standard electricity unit rates. All domestic electricity prices quoted from 1 October 2018. 5% VAT rate applies. Prices may be subject to change. Figures have been rounded to two decimal places. Discounts vary by meter type. This offer is valid from 1 November 2018. Selected electricity customers will be eligible for €165 Welcome Credit and selected Dual Fuel customers will be eligible for €260 Welcome Credit (the “Offer”) and will be emailed with instructions on how to redeem the offer. The Offer applies to selected new domestic SSE Airtricity Electricity and Dual Fuel customers (where Dual Fuel customers both receive gas and electricity to the same address), who have received communications about this offer and signed up for direct debit and ebilling (the “Customer”). The Offer can only be redeemed following the successful payment of your first bill and provided the Customer continues to be supplied by SSE Airtricity. The Offer must then be redeemed within one year from the date that SSE Airtricity is registered as your supplier (the “Term”) or SSE Airtricity may withdraw the Offer. The Offer may be redeemed online through www.sseairtricity.com or by clicking on the applicable link contained within the instruction email. If you are unable to redeem online, please contact SSE Airtricity on 1850 40 40 70 (Charged at Lo Call rate. Rates may vary so please check with your operator). Once redeemed the Offer will be applied to your account within 60 days and will be displayed as €145.37 + €19.63 VAT on Electricity Customers’ bills and €229.07 + €30.93 VAT on Dual Fuel Customers’ bills. SSE Airtricity reserves the right to cancel, amend or withdraw the Offer or these Terms and Conditions at any time without prior notice. Tariff discounts against SSE Airtricity Standard electricity unit rates. Offer valid from 1 April 2017. Rates valid from 3 December 2018. Rates subject to change. From 3 December 2018 we’re increasing our electricity standard prices by 6.3%. The increase applies to unit rates and standing charges. Figures have been rounded to two decimal places. Standing charges also apply. 13.5% VAT rate applies. The Public Service Obligation (PSO) levy for electricity has been set at €3.95 (inc. VAT) / €3.48 (ex. VAT) per month from 1 October 2018. This applies to all domestic electricity customers, irrespective of supplier. Offer is subject to a 12 month contract. Largest provider of 100% green energy claim and total TWh supplied to homes and businesses based on Electricity Market Share by MWh published by the Commission for Regulation of Utilities (CRU) in Retail Market Reports for the periods Q1-Q4 2017. Tariff discounts against SSE Airtricity Standard gas and electricity unit rates. Offer valid from 1 November 2017. Rates valid from 14 July 2018. Rates subject to change. From 3 December 2018 we’re increasing our standard prices for electricity by 6.3% and for gas by 6.9%. The increases apply to unit rates and standing charges. Figures have been rounded to two decimal places. Standing charges also apply. 13.5% VAT rate applies. The Carbon Tax has been set at €0.00420 (inc. VAT) / €0.00370 (ex. VAT) per kWh. This tax applies to all domestic natural gas customers, irrespective of supplier. The Public Service Obligation (PSO) levy for electricity has been set at €3.95 (inc. VAT) / €3.48 (ex. VAT) per month from 1 October 2018. This applies to all domestic electricity customers, irrespective of supplier. Offer is subject to a 12 month contract. 1 Year Keypad Electricity introductory discounts may vary by meter type (“Tariff Discounts”). Your Tariff Discounts will be applied from the date that SSE Airtricity is registered as your supplier and will continue for the remainder of that calendar month and the following 12 consecutive calendar months from that date (“Term”). Your Tariff Discounts are calculated by reference to the SSE Airtricity standard tariff (“SSE Airtricity Standard”) which may be amended from time to time during the Term but this will not affect your Tariff Discount. You may cancel the Tariff during the period of 14 calendar days from when the contract information is sent to you following your sign-up for this Tariff (“Cancellation Period”) by writing to us by post or e-mail or by contacting us on 0345 850 8935 (local rate.) You may use the cancellation form provided to you but you do not have to. If you leave the Tariff after the “Cancellation Period” or the Agreement is ended by you at any time before the end of the Term, a termination charge of £40 may be applied to your account. SSE Airtricity reserves the right to amend the electricity unit rates or charges that apply to the Tariff at any time during the Term if there is a cost to SSE Airtricity imposed by a governmental or statutory body (including a change in VAT) or as otherwise provided for in the SSE Airtricity General Terms & Conditions. The Tariff Discounts may not be used in conjunction with any other SSE Airtricity electricity offer, discount or tariff. SSE Airtricity reserves the right to withdraw the Tariff without notice at any time prior to the start of the Term. After the expiration of the Term, your SSE Airtricity account will be switched to the SSE Airtricity Standard rates applicable at that time. Guaranteed discount(s) against SSE Airtricity Standard electricity unit rates. All domestic electricity prices quoted from 1 October 2018. Subject to a 1 year fixed term contract. 5% VAT rates applies. Prices may be subject to change. Figures have been rounded to two decimal places. This offer is valid from 1 October 2017. Please note, all Keypad customers get a continuous discount of 2.5% off the SSE Airtricity standard rate. £5 Welcome Credit is only available for new customers to SSE Airtricity electricity Key Pad. The £5 will be applied during your transfer call. This welcome credit can only be applied once and cannot be used in conjunction with any other offer. There is no cash alternative. We reserve the right to amend welcome credits. £5 Welcome Credit is inclusive of VAT. Tariff discounts against SSE Airtricity standard electricity unit rates. Offer valid until 14 December 2018. Rates valid from 3 December 2018. Rates subject to change. Figures have been rounded to two decimal places. Standing charges also apply. 13.5% VAT rate applies. The Public Service Obligation (PSO) levy for electricity has been set at €3.95 (inc. VAT) / €3.48 (ex. VAT) per month from 1 October 2018. This applies to all domestic electricity customers, irrespective of supplier. Offer is subject to a 12 month contract. Tariff discounts against SSE Airtricity standard gas and electricity unit rates. Offer valid until 14 December 2018. Rates valid from 3 December 2018. Rates subject to change. Figures have been rounded to two decimal places. Standing charges also apply. 13.5% VAT rate applies. The Carbon Tax has been set at €0.00420 (inc. VAT) / €0.00370 (ex. VAT) per kWh. This tax applies to all domestic natural gas customers, irrespective of supplier. The Public Service Obligation (PSO) levy for electricity has been set at €3.95 (inc. VAT) / €3.48 (ex. VAT) per month from 1 October 2018. This applies to all domestic electricity customers, irrespective of supplier. Offer is subject to a 12 month contract. These calls will be charged at Lo Call rates from any landline in the Republic of Ireland calls made from mobile phones will cost more. How do I find out my MPRN or GPRN? What do I need to switch to SSE Airtricity? How long will it take to switch to SSE Airtricity? You can find your Meter Point Reference Number (MPRN) or Gas Point Reference Number (GPRN) on any of your past bills. Your MPRN will be 11 digits, and your GPRN will be 7 digits. Your MPRN/GPRN is linked to your property so it will change every time you move. If you’re moving into an existing property the easiest way to find your new MPRN/GPRN is to ask your landlord (if applicable) or the previous occupiers, or see if there are any old bills around. Gas Networks Ireland on 1850 200 694^ to verify your GPRN. If you’ve bought an apartment or house on a scheme, you should contact your builder. Click on 'Billing Overview' and open any of your past PDF bills. If you've tried all of the above and still can't find your MPRN/GPRN, just contact our Customer Service team. Your MPRN/GPRN is linked to your property, not your account so they will change every time you move. If you've moved and are having trouble finding your new MPRN/GPRN try your landlord (if applicable) or the previous occupiers, or check for any old electricity/gas bills in your new property. Once you have all these details you can either switch online here or call our Sales team on 1850 81 81 10^. ^Calls will be charged at Lo Call rates from any landline in the Republic of Ireland, calls made from mobile phones will cost more. Whether you’re switching to just electricity, or electricity and gas. However, your registration is usually completed within 2 weeks, and your first SSE Airtricity bill should arrive within 8 to 10 weeks of your sign-up date. Find out what happens during the switching process and things that can speed it up (or slow it down).